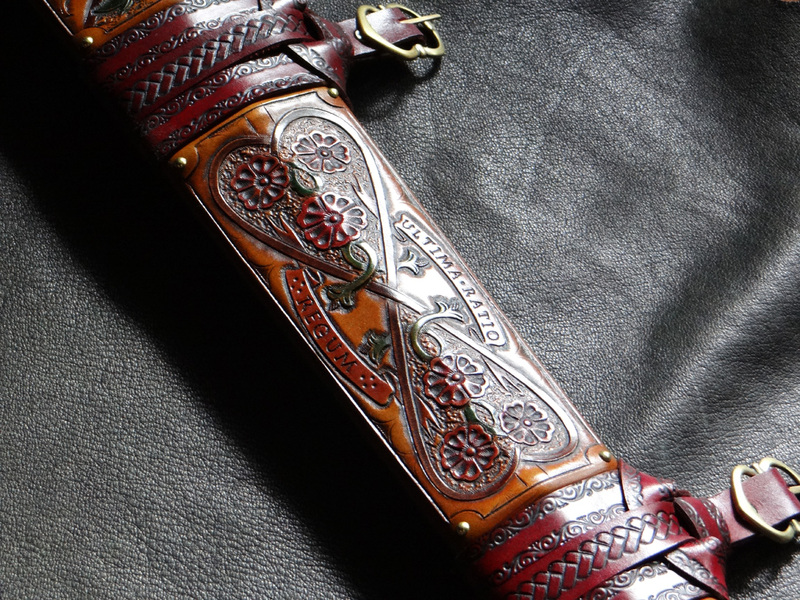 I'd like to share a recently completed scabbard for the Albion Earl / Regent. 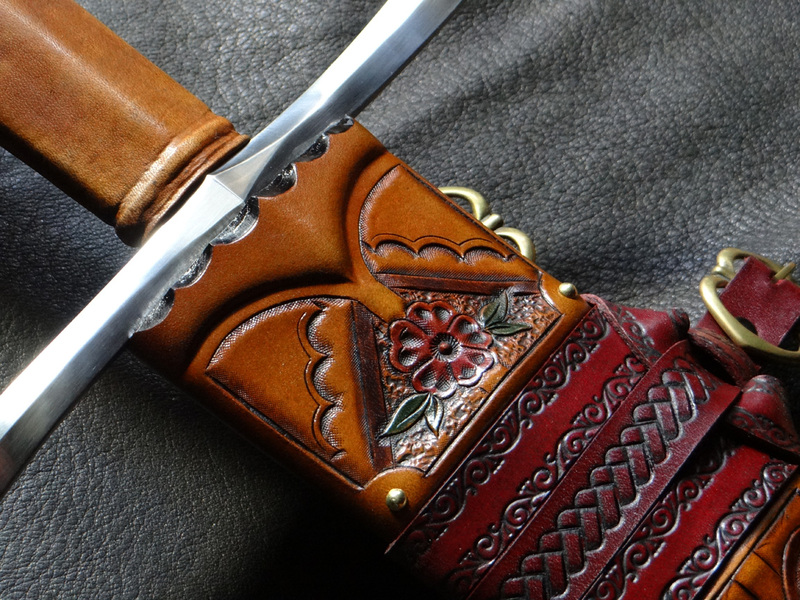 This is a non-commissioned scabbard that I made in between commissions, and I'm considering putting it up for sale, but for now it's in my personal collection. 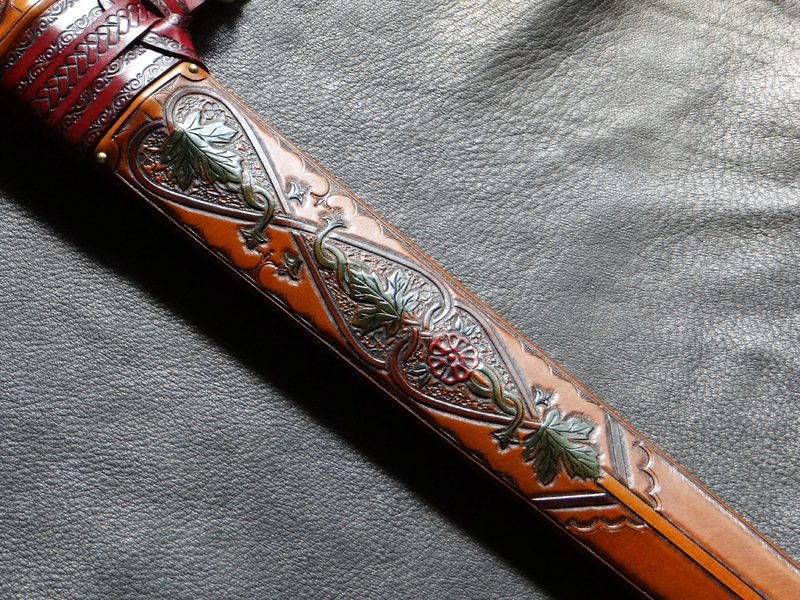 The scabbard has a russet tan base with multi-colored details, and a semi-finished 2.5-point suspension harness in ox blood. 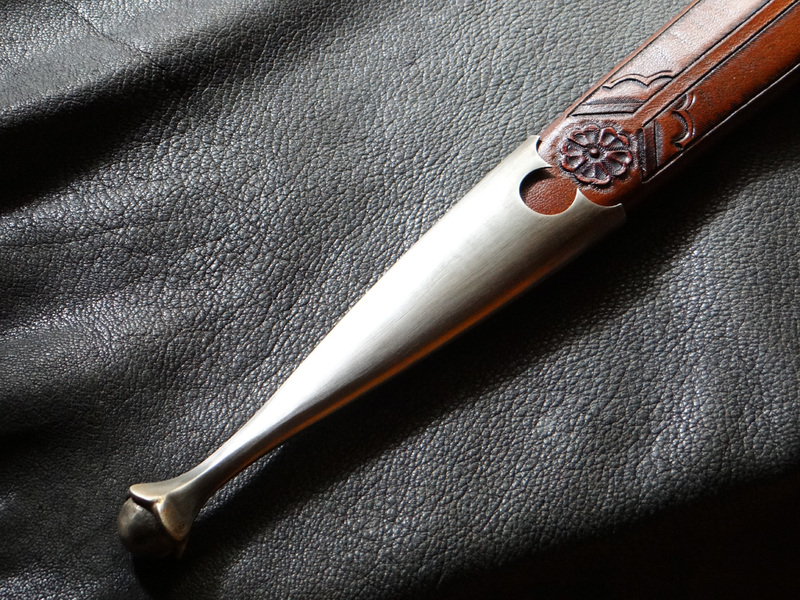 It features a wool lined poplar (lacquered) wood core. 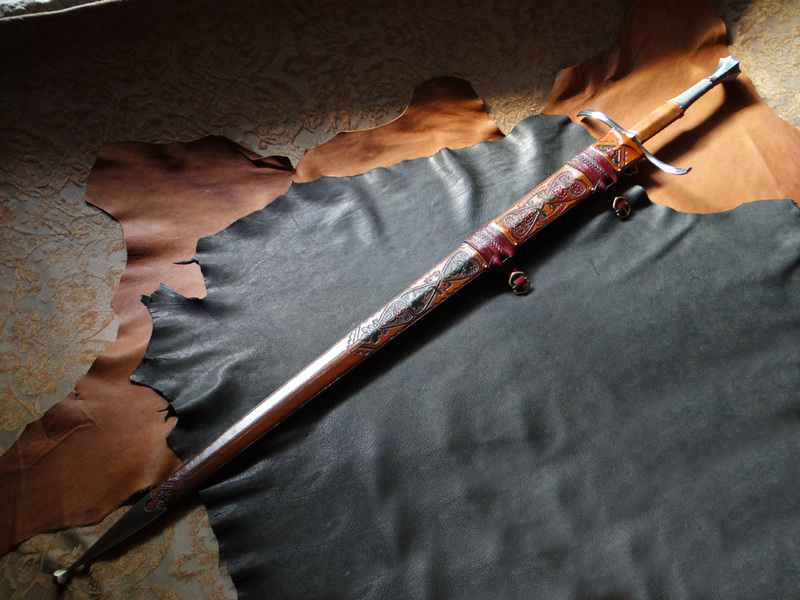 The wood core was sanded in a unique style to compliment the shape of the blade. Commentary & questions are welcome! That may be your best one yet. Outstanding. That is just mouth wateringly good... The chape is so well done. Definitely a high water mark in scabbards! Damn fine job Brian. Thank you Patrick and Tim. I was really unsure about this one at first because it's different enough from what I normally do I worried the end result wouldn't look good enough, but I stuck with it and followed through to the end. As such, I'm glad I did. That high contrast color work is really something else, great way to make that detailed leatherwork stand out at a distance. I love the artistic expression here... and as mentioned above, that chape is divine. Thank you Dan and Nathan. 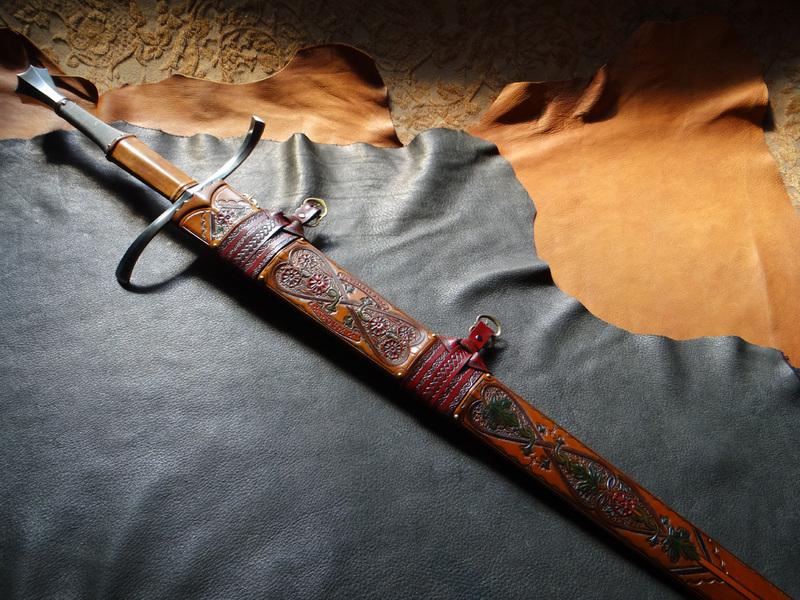 It was a fun scabbard to make and as an artist it's good to do projects periodically that take you a little out of your comfort zone. Wow, thanks Jean. You always say the nicest things. Always appreciated. Another fantastically executed design from you Brian, so exactingly detailed the mind boggles. Well that is some great work. I don't know what I can add to the above compliments, I've noticed so many great things here. I am very glad I'm in your queue! Thanks for the kind words. Feedback is always appreciated. beautiful work as always great detais and all design.